The dawn light did not mean sun to come, for there was a thick mist filling the air. Simon got to his feet and glanced back over his shoulder. Two rough pillars of reddish rock stood there, between them no city yard but a stretch of the same gray-green moor running on and on into a wall of fog. Petronius had been right: this was no world he knew. Simon Tregarth is an America commando kicking around Europe after World War II. Although honorable, he has managed to get himself kicked out of the army and into the bad books of black marketeers who want him dead. So Simon has little to lose when a stranger offers him a one way trip through a magical portal. And so kicks off a pleasingly rubbish tale of magical kingdoms, knights, aliens, zombies-in-all-but-name, princesses in disguise, daring escapes, and more than a few witches. Quite the gallimaufry. As a lead character, Simon has many faults. His interesting backstory is almost completely ditched right from the moment he steps foot in Witch World and he ends up pretty much a sidekick to various more interesting and proactive people. This is obviously a deliberate choice by Norton and it leads to some hilarious scenes of Simon standing by while other people do the heroic deeds that advance the plot. He is no slouch when it comes to two-fisted action though, despite being fairly dim. The writing it Witch World is workmanlike - not howlingly bad but nothing remarkable either. It doesn't hold up well against similar novels of today in this department, one area that genre writing has improved on in the intervening decades since Witch World was published is style - Witch World just doesn't have any. What it does have is an entertaining plot. I think Norton may have written this as a response to the male-heavy fantasy of Lord of the Rings and its ilk. Simon and the prince he pals around with are men but it is woman that drive the plot and call the shots, and Simon is happy to go along with it which probably counted as radical in 1963 Even today the fantasy genre can be embarrassingly male. See The Blade Itself for an example. I won't say Witch World strikes a blow for woman everywhere - the whole novel is very slight and perhaps I am reading in things that aren't there, but I feel there was at least an attempt to try something different. 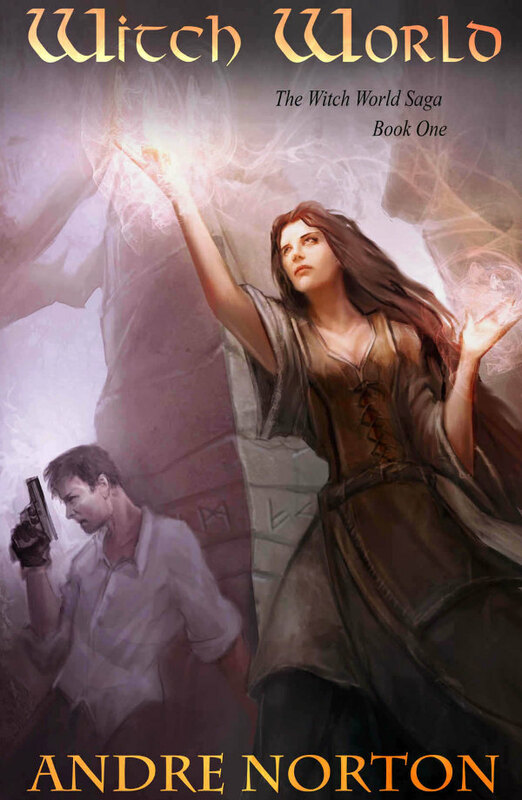 In any case, Witch World is an quick, enjoyable romp. 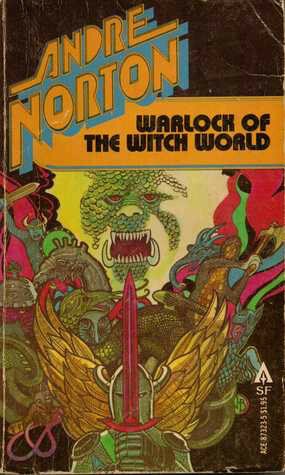 by Andre Norton Witch World was a popular book and Norton wrote a bunch of sequels, of which Warlock of the Witch World was number 4 in the sequence. So Simon Tregarth got married at the end of Witch World (um, spoiler alert for a 50 year old book, I guess), and his 3 dopey triplets (Kaththea, Kyllan, and Kemoc - is this where the Kardashians got the idea?) are now grown but relocated to another part of the continent. And wouldn't you know it, Kaththea has gotten herself kidnapped by a Warlock. Can Kemoc rescue her? Probably. Where Witch World had a very high fantasy feel, Warlock has a different setting with a far greater population of talking animals - add a lamp post and some Turkish delight and we could be in Narnia. The war with the invading aliens that began in the first novel is still being prosecuted, with everyone else busy with the battle Kemoc must venture out alone. Kaththea is such a dim bulb that perhaps nobody else really wanted her back. I found Warlock of Witch World a bit of a slog to get through. I critiqued the first book on having a very plain writing style, here the prose is a little more flowery but it is really not an improvement. The plot is pretty much a straight A to B quest, I have seen D&D modules with more complicated stories. To be fair, the hero is forced to traipse through many interesting environments, eventually ending up in another dimension with different physical laws. I like this sort of thing so it is not a total loss. I also appreciated that Norton had the guts to go for a somewhat downer ending. I'll admit that I bought Warlock of The Witch World mainly for the terrible cover art, which looks like something a 13 year old boy would draw during a particularly boring algebra class. Sadly the book itself just isn't as amusing.